A very versatile hand held enclosure with customizable end plate and recessed area. IR plate, transparent red plate or standard ABS plate. Now available in 4AA version. 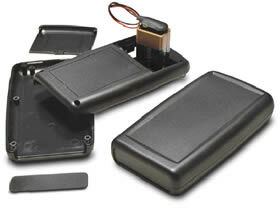 55 Series Shell Case with End Panel - Standard SHALLOW top, 9-volt batt. 4.94 x 2.75 x 0.94"
55 Series Shell Case with End Panel - Standard SHALLOW top, 4 AA batt. 55 Series Shell Case with End Panel - Standard SHALLOW top, 2 AA batt. 55 Series Shell Case with End Panel - Standard SHALLOW top, No batt. 55 Series Standard End Plate. Pack of ten. Pouch, belt strap, adjustable from 5.75 x 3.5 x 1.5" to 4.75 x 2.5 x 1.5". Velcro cover with see through window.